Status: Rare casual fall migrant statewide. Documentation: Specimen: Olson Collection at UNK, 8 Oct 1917 Buffalo Co (Swenk, Notes After 1925; Bray et al 1986). This species, which has DNA almost identical to that of Great Skua (Stercorarius [Catharacta] skua), may have arisen from a hybridization event involving Great Skua and Long-tailed Jaeger (S. longicaudus) (Olsen and Larsson 1997); Wiley and Lee (2000) add that the genetic and behavioral similarities between Pomarine Jaeger and Great Skua suggested that “Pomarine Jaeger [should be included] with the large skuas”, and that “it seems reasonable to unite them all in a single genus Stercorarius”. This approach is followed by Gill and Donsker (2017) and herein. Fall: Among several reports of birds purported to be this species, only 14 are accepted. Jun-Aug records are of adults and Sep-Dec records are of juveniles and immatures. 30 Jun 1990 light morph adult photographed Lewis and Clark Lake, Cedar Co (Grenon 1991; Brogie 1997). 21 Jul 2001 light morph adult Lake McConaughy, Keith Co (Jorgensen 2003). 21 Oct 2001 juvenile Santee, Knox Co (Silcock 2001). 15-17 Dec 1991 Conestoga Lake, Lancaster Co (Gubanyi 1996). Comments: Since 2000, as information about distinguishing jaeger species has improved and become readily available and as observers are better able to document jaeger sightings, there have been fewer sightings of jaegers not identified to species; see Sharpe et al (2001) for a summary of older records. 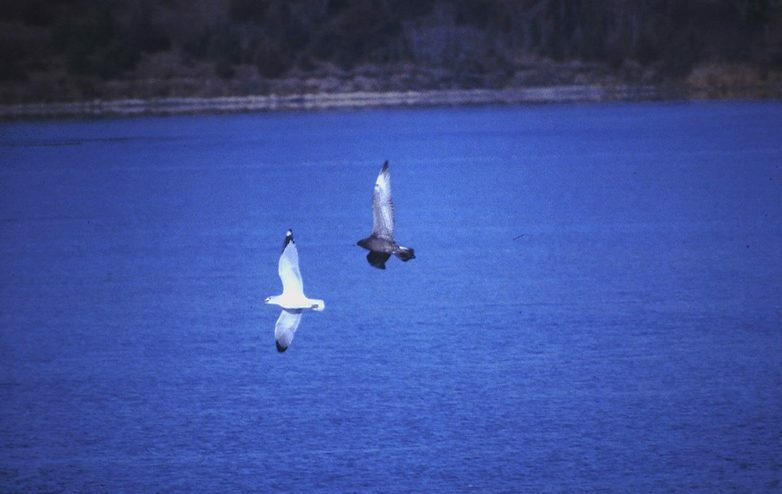 Photograph (top) of a Pomarine Jaeger chasing a Ring-billed Gull at Pawnee Lake, Lancaster Co 16 Nov 1997 by John Sullivan. Cortelyou, R.G. 1974. 1973 (Sixteenth) Fall Occurrence Report. NBR 42: 22-41. Olsen, K.M., and H. Larsson. 1997. Skuas and Jaegers: A Guide to the Skuas and Jaegers of the World. Yale University Press, New Haven, Connecticut, USA. Sharpe, R.S., W.R. Silcock, and J.G. Jorgensen. 2001. The Birds of Nebraska, their Distribution and Temporal Occurrence. University of Nebraska Press, Lincoln, Nebraska, USA. Silcock, W.R. 2001. Fall Field Report, August-September 2001. NBR 69: 158-189. Silcock, W.R. 2005. Fall Field Report, August-November 2005. NBR 73: 134-150. Silcock, W.R. 2006. Fall Field Report, August-November 2006. NBR 74: 110-128.